At a ceremony yesterday at Royal Australian Air Force Base Townsville in northern Queensland, Australia commissioned their first two Boeing [NYSE: BA] CH-47F Chinook advanced configuration aircraft. It’s a major milestone in the updating of the Australian Army’s cargo helicopter fleet. The acquisition is part of an ongoing transformation that’s allowing Australia to build one of the world’s newest and most technologically advanced armed forces. Five additional new Chinooks will be delivered this year, eventually replacing an existing fleet of six older CH-47D Chinooks. Australia was among the Chinook’s first international customers and now there are almost twenty countries operating the helicopter. 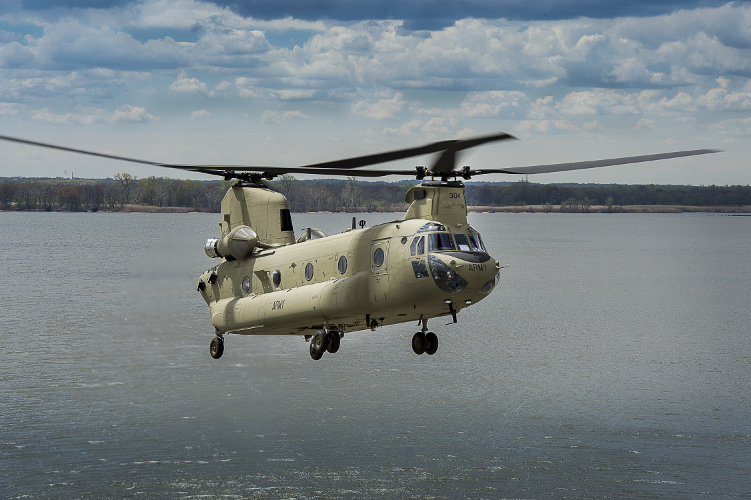 “Working with our Australian allies to build a modernised Chinook fleet enables more seamless operations with U.S. and other forces,” said Col. Robert Barrie, project manager, U.S. Army Cargo Helicopter Office. The Australian Chinook fleet is flown by the Army’s 5th Aviation Regiment, 16th Aviation Brigade. Under the scope of the contract, Boeing Defence Australia will provide delivery and on-site operational maintenance support to the seven aircraft. For more than 70 years, Boeing and Australia have maintained a partnership operating and supporting a broad range of platforms that now includes, in addition to Chinook, the Wedgetail Airborne Early Warning and Control System and C-17 Globemaster III.